The Reign of the Queen . . . The heavens open to reveal the beauty of a young Queen. She lived, she loved, and how she loved! One must not think that the brevity of Queen Shairice's life is to a reflection of the things that she did not have time to complete. Oh the things she has done! Queen Shairice recognized only the good qualities in everyone she encountered and in turn, she gave completely of her loving soothing, energetic spirit. How she now reigns as the Spirited One! She served as a template for positive thinking, intrinsic motivation and progressive movement. Perhaps the cliche' is older than Queen Shairice, but her life gave validity to the saying that "Good things come in small packages". Despite her petite physical existence--one must not say that Queen Shairice has been a small person. Her very essence exceeds measurement. People would often say of the Quenn, "Girl, I don't know how you do it, but you are too much for me!" Queen Shairice mastered the art of doing an immense amount of tasks by putting everything that is her into one day. This is not a woman that did not do all she wishes to. She would often say, "It's easy if you take it one day at a time and love each and everything you do." From the very time the Earth was blessed enough to receive her -- Queen Shairice's jubilance has been an example of how all ought to live. Oh what untiring spirit! Queen Shairice has been and is a model daughter to Dyrice and Robert and Carlos, and a loving and guiding sister of Kel'ley, Robert, Ruthie, Sabrina and Jessica. Many mornings the Queen realized that everything must be taken in stride and with peace, thus she would often stop off to her Grandmother's for a little wisdom and a spot of tea. To say that she is gone would be incorrect for the things she has done to effect the lives of so many will continue to resonate throughout the heavens and the world. Whitney M. Young High School prepared Queen Shairice to study for, and receive her Bachelor's Degree in Business Administration/Marketing at Lewis University. Queen Shairice was active in Black Student Union, Student Exec. Board Rep., licensed speaker for the AIDS prevention program, varsity cheerleader, and secretary to the Dean of Student Affairs. She also became an active member of Delta Sigma Theta Sorority Inc. and served on local and national committees. Her awards and honors in life are innumerable. Her unending love for cheerleading led her to become coach of the Chaney-Monge School where she served for the past two years. 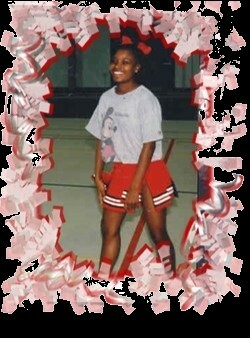 Queen Shairice began her teaching career at Mark T. Skinner School where she was affectionately known as "Lil' Garner." She quickly made her indelible mark on the hearts of the students and staff alike. She earned the admiration and respect of the student body, her colleagues, her superiors; she became an asset not only to them but in all avenues of her life. Queen Shairice's spontaneity and desire to do so much led her to become a contestant in the Miss Illinois Pageant 1998 in which she did amazingly well. Louis Lamarr Lee, Jr., her King and soulmate along with the rest of her family now invite all to witness the heaven's welcoming of the spirited butterfly. She reigns as the perfect display of godism -- behold the Goddess of Essence. Essence of what? -- Everything . . . Behold the Queen! Do take this opportunity to celebrate all that is Reece. In the words of none other than the Artist himself, "Let this be the Jam of the Year, Betcha by Golly Wow, Get Yo Groove On, Let's Go Crazy!!" -- Witness the EMANCIPATION!